which Mimi Lenox started in 2006. That's a fabulous globe and quote, just terrific. Peace to you all, today and always! Nice quote. Peace to all of you. I love your peace globe and quote. Peace be with you today and every day. Lovely peace globe. Peace to you. 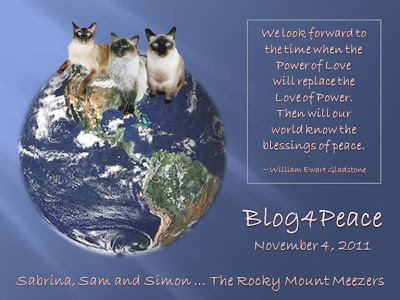 Peaceful and peace-filled cats... love it! Peace to all of you...today and every day!! I love what you've done with this globe. It is mellow and groovy (I said groovy again) and just right. We love your peace globe and your quote.